Jika Udon is a solid, quick place to grab a bowl of udon to eat as one of the newer additions to the Xinyi Vieshow Food Court. They have their own separate seating area, so if you want to eat alongside your friends ordering Burger King, you'll have to get your order to go, as I did, and eat in the main food court area. I uncapped my tempura as soon as I picked it up, so that the delicate crispiness wouldn't get soggy and laid out my lunch- tempura, cold udon and dipping sauce (NT$220). They only give you one sauce for both the udon and tempura, which is fine, since they also include a small bit of wasabi, grated radish and green onion slices. The udon is quite chewy and QQ and the crispy tempura (with two shrimps) provided a satisfying crunch. It's good to have a sanuki udon place in the area, especially after my original go-to place at Vieshow, Tenpura Sanuki Udon, moved and shut down. 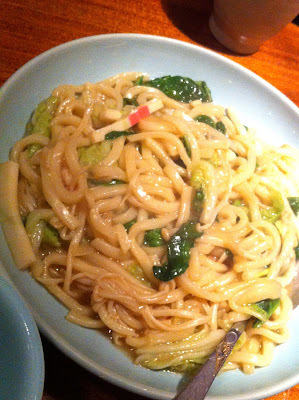 I was surprised by the amount of udon that I got- it would have filled a large bowl and was quite filling. 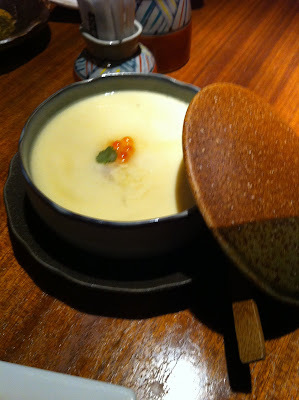 Jika Udon's menu (in English, Chinese and Japanese with lots of photos) is worth exploring- with hot udon soups or cold udon, or options like curry udon, udon with cod fish caviar or udon with chicken or seafood salad which caught my eye, most from NT$100-NT$230. It's been awhile since I've been able to make the trek out to Danshui for Mexican food at Eddy's Cantina. Of any foreign food in Taiwan, especially Mexican food- there will be lovers and there will be critics- all relative to what you're expecting and what you order and how long you've been in Taiwan and if you've tried the other places in Taipei that serve "Mexican" food. I hadn't been back for a couple of years so I was curious to see how it would compare to my first few visits. For me, the chicken enchiladas (NT$250) still hit the spot- seasoned chunky bites of chicken, tortillas soaked in a sweet and tangy red sauce and melted cheese on top. If it's not spicy enough for you, spoon some of the chunky salsa atop. After devouring my portion of the nachos, I actually couldn't finish the good sized enchiladas and had half of one as leftovers the next day and it still worked. New additions to the menu included fish tacos which I might have to try sometime. The nachos had plenty of chips underneath the cheese and taco seasoned ground beef. I could have used more cheese, but then again, I also like goopy nacho cheese cheese. The bite of carnitas I had was still good, but got lost a little bit in the carnitas burrito with the soft rice and refried beans. It would have been nice to have more carnitas to rice/beans ratio (and tossing in some pico de gallo and cheese). With the opening of Oola and closing of La Casita, I've been fulfilling my burrito cravings a little bit closer to home and there's nowhere else I know of in Taipei that I can get enchiladas anymore. Here's to hoping Eddy will someday open a place in Taipei that's a bit closer than Danshui! my kitchen: happy turkey day! A snapshot of last year's Thanksgiving in Taipei where I took the time to make all the sides that I loved to go with the smoked turkey that a relative ordered- corn, garlic mashed potatoes, stuffing, sauteed mushrooms and candied yams'. This year, I'm trying Thanksgiving dinner with a group of friends at a place I'm hoping doesn't disappoint... If it doesn't hit the spot, I'm going to be busy trying out my friend's sweet potato casserole recipe and baking some cornbread Friday. What places have you guys tried for Thanksgiving dinner out or where do you get stuff for making it at home (canned pumpkin? cornbread mix? recipes for your favorite thanksgiving side?) or is it too much work (and expensive) trying to celebrate such an American holiday in Taipei? Kid friendliness: high chairs, kids dinnerware available. private rooms available. With a little bit of everything on the menu, in addition to its sushi/sashimi, Ton Sushi is a surprisingly good spot for family dining for Japanese food. You might not spot it, hidden in the back of Neo 19, around the corner from Macaroni Grill or if you head straight up the escalator for Chili's/Momo Paradise/Watami, but that's what enabled us to grab a table on a busy Sunday night. After checking in with Chili's (1 hour wait) and Macaroni Grill (30 minute wait) for a party of 5 at 6:30pm, Ton Sushi was able to seat us right away. The space is modern and sleek, with a seating area apart from the sushi bar as well as several private rooms. 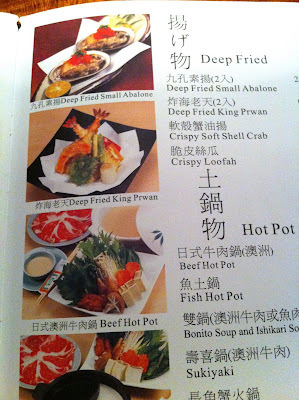 The English and Chinese menu has plenty of photos for reference, likely of its most popular items- including tempura, hot pot, rolls, sushi, grilled items, sashimi and appetizers. 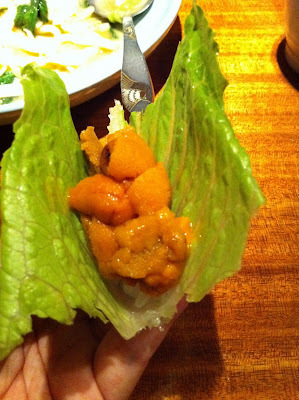 Besides some of the traditional items you might spot at other places, they have some unique items like, foie gras sushi, truffle beef sushi, black toro sushi, or Uni and Salmon Roe Sushi served upon a romaine lettuce leaf (NT$560). The salad with fruit comes dressed with a sweet and citrus Japanese soy dressing underneath and is topped with chopped mountain yam, tomatoes, avocado, apples, kiwi and cucumber. Or you can try the mountain yam which is grated and placed carefully like a bed of noodles. The stir fried udon had sliced fish cake, chinese cabbage, straw mushrooms and another dark green leafy vegetable I can't place. It was slippery and well seasoned, perhaps bordering on the salty side for some. 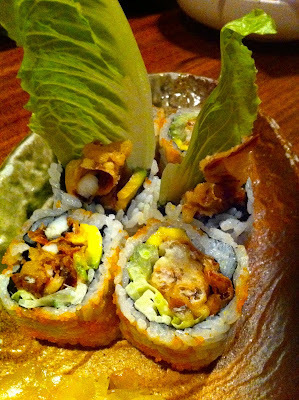 I was craving the Soft Shell Crab roll (NT$300) which came with six pieces- the soft shell crab was fried with expertise, though I found the romaine lettuce an unnecessary addition. 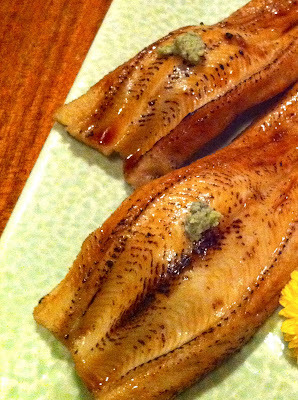 As I've been learning more about sashimi by eating at sushi bars with friends, I've discovered a new love- broiled anago (NT$380), or salt water eel. If you are a fan of unagi (fresh water eel), you have to try anago! 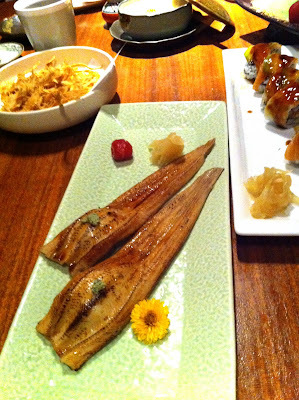 I feel like it tastes less rubbery than how unagi can sometimes be, more creamy and sweet. And Ton Sushi offered up one of the biggest pieces of anago sushi I've ever seen! It almost belonged atop of a bowl of rice. The bowl of steamed egg with scallop (NT$180) disappeared quickly. 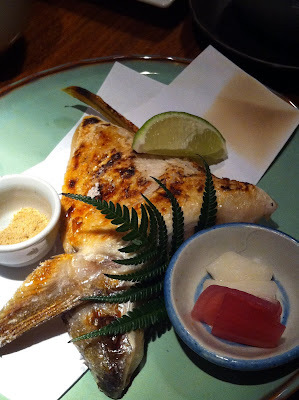 I also really enjoyed the grilled fish collar which offers tender, moist fish without digging through bones or fishy flavors. 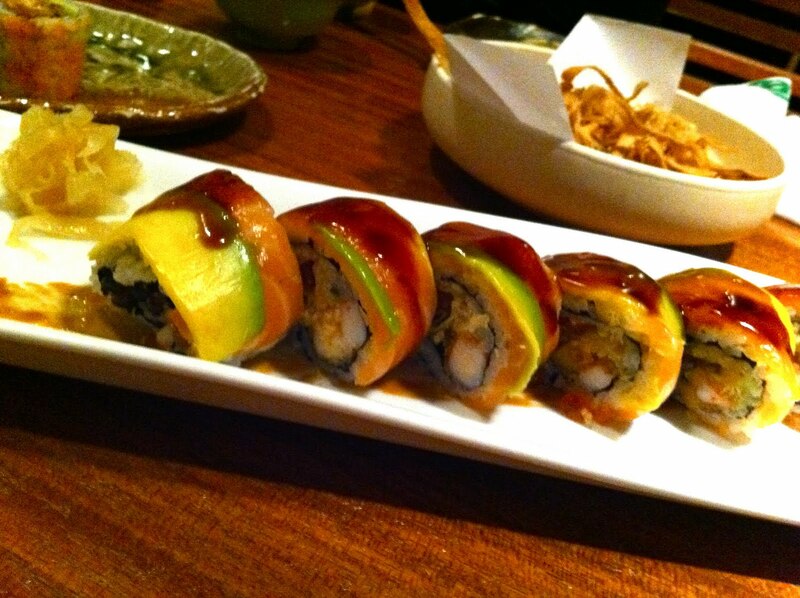 The skin wasn't as crispy as I've had it at Sumie, but the inside was still great. 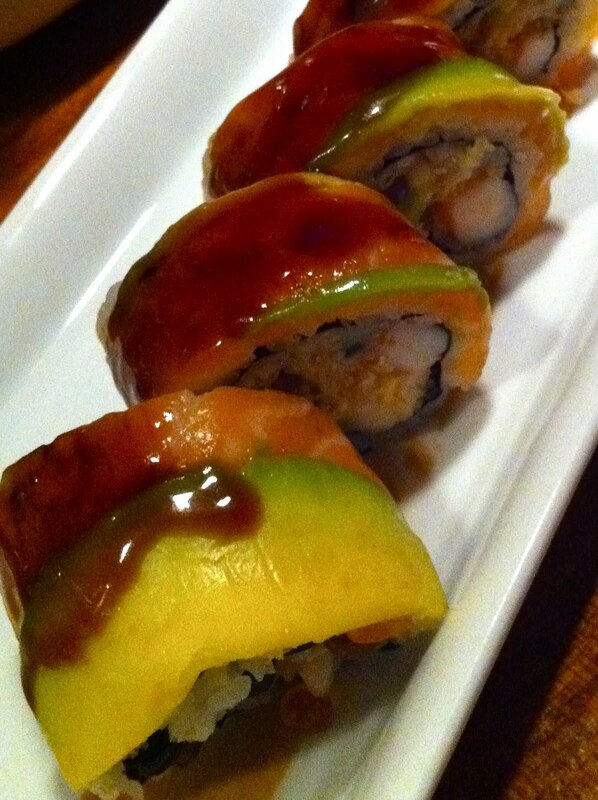 While this is my third or fourth time going to Ton Sushi, it was the first time I was in charge of ordering. The first time I went was not that memorable and the second time I went was delicious, but the night was a blur because food kept coming. While I've been making notes of my favorite sushi bars in Taipei, they are usually for those who can handle raw fish and Ton Sushi is a good option for parties that want something more than nigiri or sashimi. 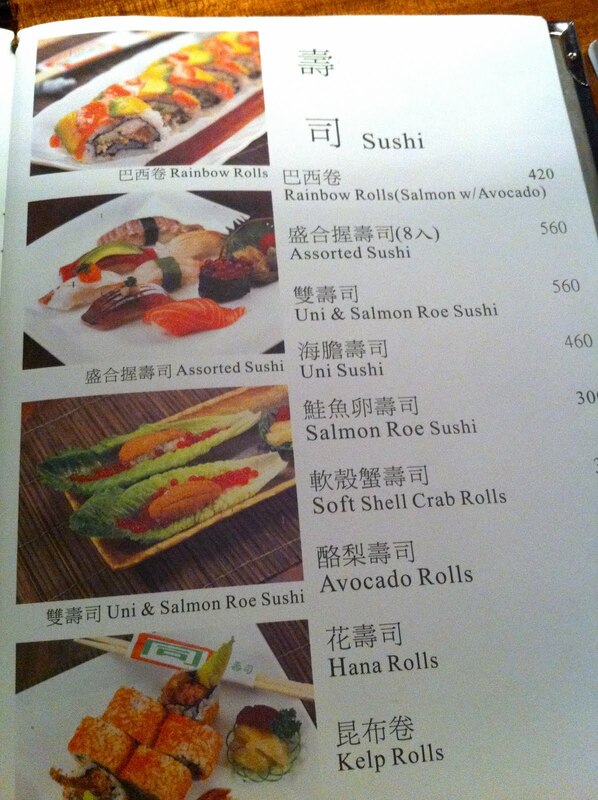 Ton Sushi is definitely on the pricier side- if it was not as expensive, it would be a strong recommend. I hadn't been back for a long time, but I can see myself coming back more- maybe sitting at the sushi bar next time and trying the omakase. No. 28, Song Ren Rd. My favorite is still the almond pon de ring, but the bear donuts are so cute, I might have to try them eventually. Their new thing these days is the green tea matcha donuts. I also love their little giveaways that you can collect stickers to earn, but usually I can't buy enough donuts to fill up a card! Check out my previous post for locations and more pictures! Don't forget to VOTE FOR YOUR FAVORITES in the hungryintaipei.com reader's favorites poll! Dan Ryan's is one of those American eateries that has been around Taipei for a long time- before the Diner, before Macaroni Grill/Gordon Biersch and before the wave of burger and brunch spots. I had heard good things about their weekend brunch, but didn't have a chance to check it out until now. I called morning that I wanted to go in and they warned me that the earliest reservation I could get was 1pm. But I asked that if anything else turned up earlier to please call me and while wandering Ikea, they called me around noon and I hurried over. To be honest, what spurred my visit to Dan Ryan's was that a reader tipped me off to their bread basket having cornbread! So when someone in our party wanted to order pasta, I made sure that we got the breadbasket. While the cornbread was a tad dry, it hit the spot. The Chinese and English menu cautions (or brags, depending on how you look at it) that they "serve American portions" and the great part is that the prices are still ready budget friendly. 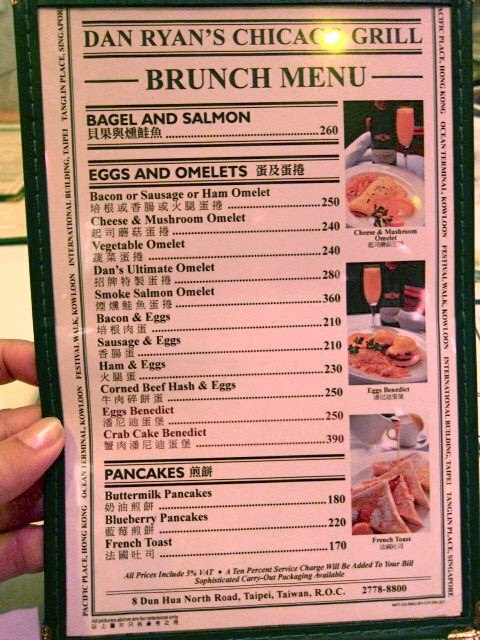 Brunch has all the traditional favorites and runs from NT$170 for french toast to NT$390 for crabcake benedicts. 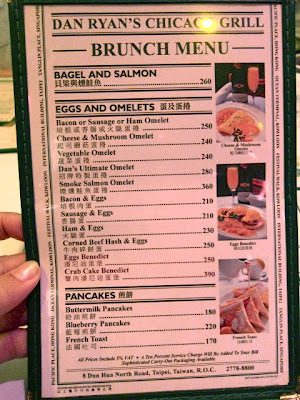 I was torn between the eggs benedicts and the cornbeef hash and eggs, but in the end I tried the eggs benedicts (NT$250). When the plate came to the table, I could tell it was a good sign- the hollandaise size was creamy and thick, not too much or too little, and the hash browns were plentiful and crisp. The french toast (NT$170) was also very good- probably the best I've had in Taipei- dusted with powdered sugar, not too eggy or dry, with a hearty six pieces served with warm maple syrup and butter. and the minestrone soup had a side of crackers for dipping. The thing that I would skip the next time was the creamed spinach which tasted more like a pureed spinach with butter- I'm sticking to Lawry's version. But all in all, I'm excited to go back and try the other brunch items at Dan Ryan's, like the pancakes and corned beef and hash... I'll just have to make sure to call before that day to make my reservations! 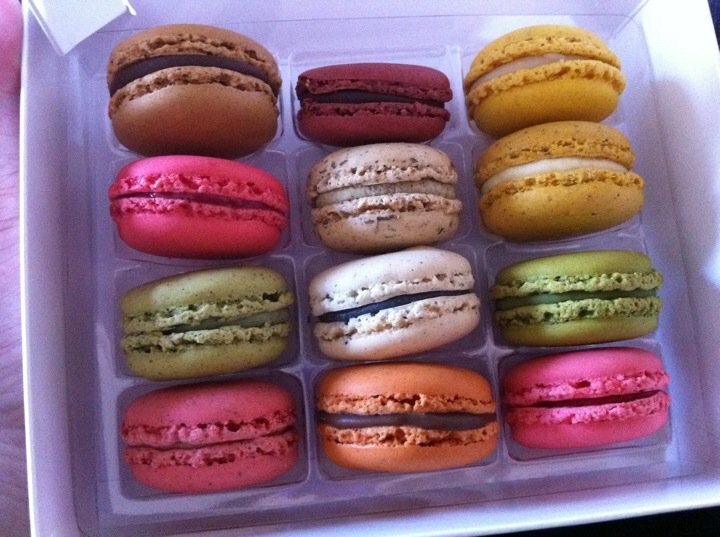 A lovely surprise from a friend... colorful macarons for a sunny morning. I already ate one and it's 10:30 in the morning! Check out my previous visit at Patisserie Sadaharu AOKI Paris for afternooon tea. It's too bad they are not labeled, but I guess it makes the sampling more interesting. 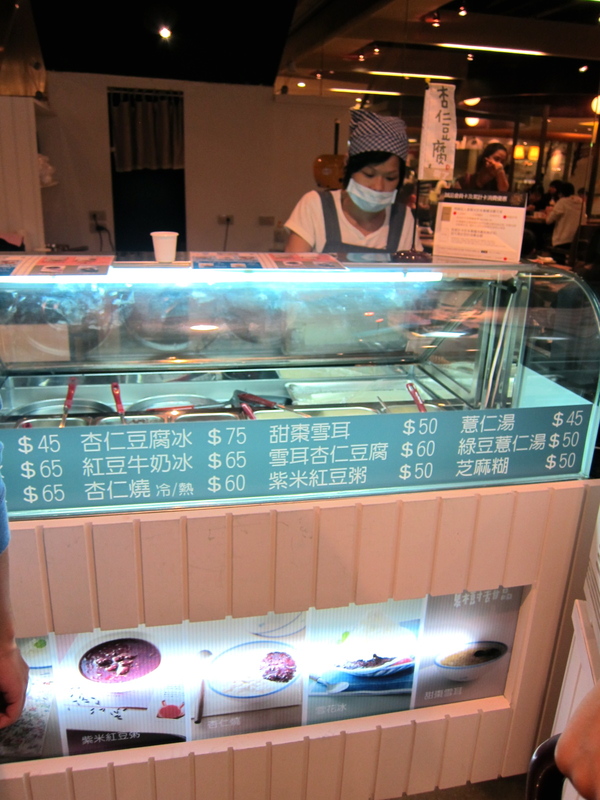 Don't forget to vote in the Best of Taipei 2010 HungryinTaipei Readers' Choice Poll!! Not as good as Yu's Almond Tofu, but convenient if you're in the XInyi area- you might miss this little area near the escalator serving almond shaved ice. I probably wouldn't have known what to order if not for my experiences frequenting Yu's and being able to read the Chinese. We got red bean and almond tofu buried underneath the freshly shaved almond milk ice and found a spot to eat it at the foodcourt. 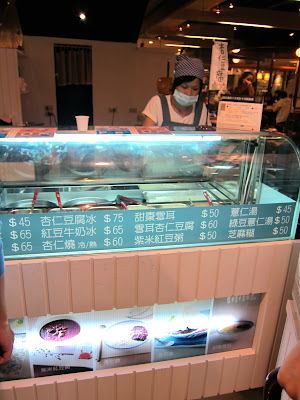 You can pick other things to have with the ice, like grass jelly, peanuts or pearl barley. My friend J from Chicago had never had almond milk shaved ice before so she was delighted to try it, but I found the almond tofu and ice not as creamy or fresh as Yu's Almond Milk. If you've never had almond milk shaved ice, it's more creamy and fine than regular shaved ice- especially the chunky ice kind. In the Eslite food court, I still prefer the Xiao Nan Men's cold soy tofu dessert, so I'd probably get that on repeat visits. When I first heard about Arvorig, I was pretty excited because (1) crepes in Taipei tend to be on the crunchy, papery side; (2) the crepe places that I had discovered before were gone- Mamm Goz and Crepes Suzette and (3) I had just gotten back from Toronto where I had some amazing crepes that reminded me how good they could be. Follow the hallway to the left of the door to the end, and you'll spot a corner bar seating area turned creperie with about 10-12 seats. The menu has a huge selection of sweet crepes (over 40) and a few savory galettes, some topped with caesar salad. All the dessert crepes are under NT$100 (most around NT$60) and include such flavors such as sugar and lemon, chocolate, honey, banana and maple syrup, peach apricot jam and pear and honey. Topping it off with whipped cream is an extra NT$20. We split a ham, tomato sauce, mozzarella and Parmesan cheeses and cherry tomatoes galette (NT$150), which was a bit on the dry side which emphasized the wheaty flavor and texture of the galette. Perhaps I was expecting more cheese like those I was familiar with back in California and from restaurants like the pricier Paul. We saved room for dessert and ordered two sweet crepes to try- one with handmade caramel (NT$60) and one with chocolate (NT$60). The flavor of the crepe had an strong egg flavor which was more noticeable with the caramel than the chocolate. If I came back again, I think I'd get the chocolate with bananas or maybe try one of the jam ones. Or ask for the goat cheese and honey galette without the lettuce. While Arvorig didn't match up to my fond crepe experiences in Toronto, it hit the spot for a soft dessert crepe at a really good price- and made by a French expat in the kitchen.